In a food processor blend the cacao and one of the bananas until well-blended and the texture is creamy. Transfer to a small container and set aside. Cut the remaining four bananas in half and peel only one side of the halved banana so you can still hold it easily. With a teaspoon or toothpick, place two dots of the chocolate-banana cream for the eyes and a longer one for the mouth near the top end. Remove the remaining peel and place banana on a serving platter. Repeat the process for the remaining bananas. 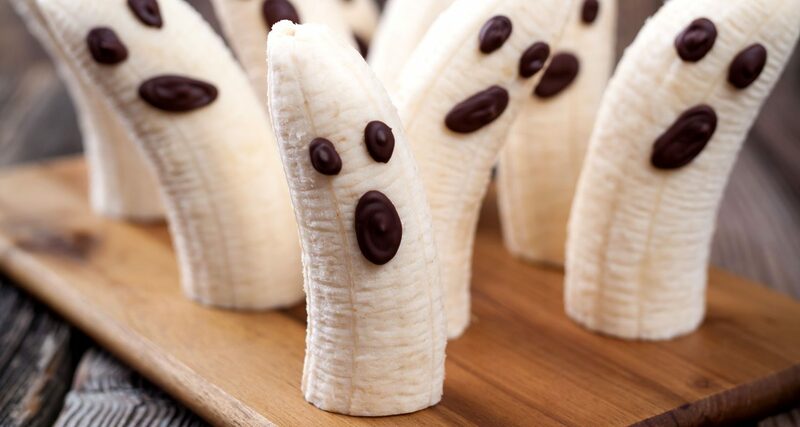 Use the left over chocolate cream as extra dip for the ghosts. Enjoy!